Playgrounds.net Blog: Are You Looking for Safe Playground Equipment? Choosing the right playground equipment for kids is a big challenge for parents. There are many options available when it comes to playground equipment like swings, see saw or playhouse. If you are looking for something which brings fun and is also safe your kid, we advise you to try wooden playground equipment. They are the safest, sturdy and last much longer than any metal play set. A survey recently conducted also reveals that, more parents prefer to buy a wood swing set for their backyard. It is safer than metal swings sets as each piece of the wood is carefully placed to remove the scope of sharp edges that can harm the children. Also, the wooden equipment undergoes several tests before the final sale to ensure durability and safety of swing set. Wooden playground equipment can withstand harsh weather conditions and resist any amount of moisture. Unlike metal swing sets, the wood swing sets do not get corroded. Coming to the fun side, most of the playground equipment is designed with many rooms which can be customized and extra areas such as cubby holes and tunnels which add more fun to the children's play. Wood swing sets and other play equipment are delivered at your door step with easy to follow instruction manual. You can easily install the wooden playing set yourself. However, the option of getting it installed by a professional is always open and you can take the help of the local landscape contractor. 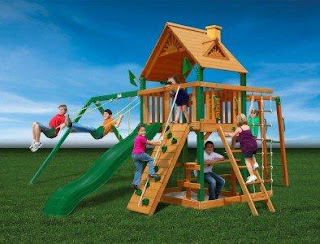 So, now that you know that wooden playground swing set is just the perfect play set for your backyard, you can browse through Playgrounds.net's collection and choose the one which seems perfect for your backyard or church or school playgrounds.